Often times Facebook likes, comments, and shares are given more weight than click-throughs when determining a post’s success or lack thereof. For those using a social media management system or specific analytics software, engagements are sometimes even explicitly defined as merely: likes + comments + shares. Unfortunately, in those cases, many people don’t know to also pull the click data separately. This is problematic. Let’s look at an example. 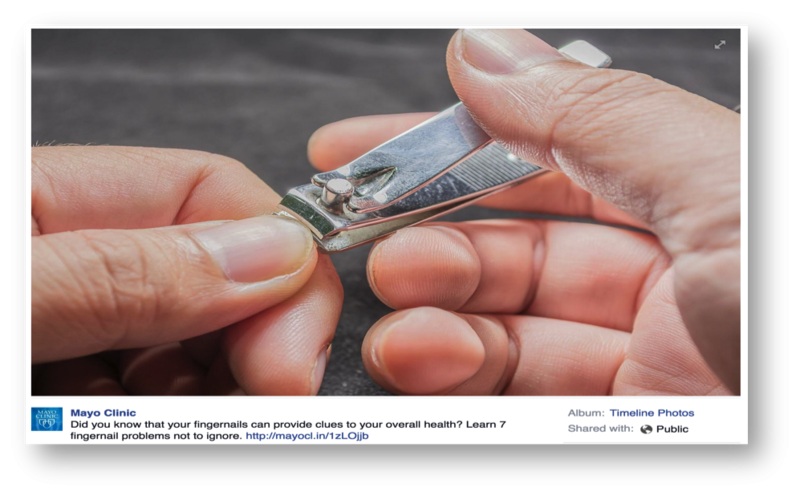 Out of all our Mayo Clinic enterprise Facebook posts throughout 2015-2016, a fingernail post ranked 406th best in traditional, public engagements, as defined by likes + comments + shares. It wouldn’t have won any awards by those metrics. However, this post performed sixth best in click-throughs in that same two-year timeframe. It beat over 5,000 other posts, receiving over 27,000 link clicks! As usual, we must go back to our objectives. If our goal was to drive website traffic, then the fingernail post was an immensely successful post. We had a similar situation with an earwax post. Due to the sensitive nature of health care content, people undoubtedly have health concerns they would prefer remain private. Similarly, it’s not culturally acceptable to publicly share the earwax or fingernail problem posts with relatives who one thinks would benefit the most! Therefore, we should expect that some of our content will not receive many shares, but may still meet an important informational need of our audience. The moral of the story is not that more people have fingernail and earwax concerns than we would have anticipated, but rather, that looking at the traditional, public engagements is not sufficient. We must also look at the clicks when evaluating post success. Have you found similar outcomes from your work that you could share? How do you accurately measure success on social media? Likes, comments and shares never tell the whole story. It's time to revisit how we define success on social media. Succeeding on social media is more than a matter of collecting likes and shares. Facebook likes, comments, and shares are given more weight than click-throughs when determining a post’s success, but those don't tell the whole story.